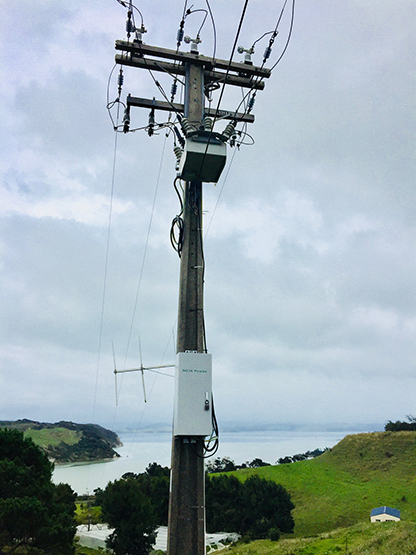 27 February 2018 – In a valley overlooking a bay on the North Island of New Zealand, NOJA Power confirm the successful commissioning of the first New Zealand installation of a NOJA Power RC10-200 Upgrade Kit. The RC10-200 system is a conversion upgrade path for NOJA Power’s Legacy RC01 controlled OSM Recloser product, providing utilities with the ability to deploy the comprehensive modern suite of protection functionality whilst maintaining use of their primary switchgear investment. Driven by rapid processes of innovation within the technology space, utility trends are growing to expect that whilst primary switchgear may last many years, control technology can struggle to keep up. Fundamentally, primary switchgear such as a Recloser can be reasonably expected to serve a full 30-year life, whilst observing the evolution of control systems can be starkly demonstrated by the difference between a 1980s computer and a modern smartphone - miraculous when observed in isolation. The RC10-200 upgrade path is a replacement of the control system, allowing utilities to maximise the return on investment in primary assets and essentially eliminating the High Voltage work required in a switchgear site upgrade. NOJA Power’s RC10-200 upgrade kit is packaged as a simple adaptor connected to one of the company's flagship control systems, providing a quick and simple interchange to upgrade the control technology connected to the OSM Recloser at the top of the pole. The option is provided to use the existing control cable, which removes all need for HV electrical work on site. The alternative is a replacement control cable with an interchange system to allow communication between the new generation of controllers with the old generation of Reclosers. All OSM Reclosers of the RC01 control generation are upgradeable using either of these pathways.